I’d come up with some excuse you could use – you have a techie boyfriend, or your mom is really into circuitry, or you want to create a dessert that expresses your true inner geekiness – but you really don’t need a reason. Evil Mad Scientist Laboratories, the evil geniuses behind the CandyFab 4000 3D Candy Printer, have come up with an incredibly detailed set of step-by-step instructions so that you, too, can be a master of edible circuitry. These folks are serious about the task. They suggest you start with a graham cracker, and then they list all available toppings you can use: licorice wheels for red and black wires, Life Savers for resistors, and marshmallows for battery cells. 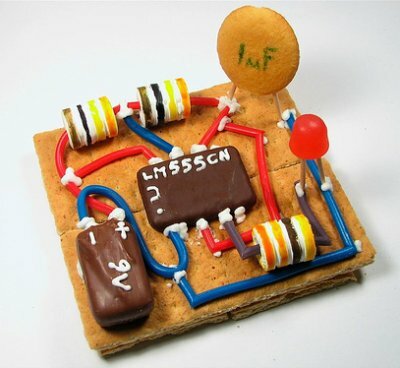 Who needs a gingerbread house when you can have a graham cracker/candy circuit board?